Comprehensive review of Neutrogena Rapid Wrinkle Repair Serum. See how this retinol cream compares against other wrinkle creams! Neutrogena Rapid Wrinkle Repair Serum is your typical “drug store” retinol product. I really didn’t see any changes to my skin other than it made my face more hydrated over time (which any lotion can do). I love the smell of this serum. It made applying it a nice experience! I feel as if this product really doesn’t compare to high-end retinol serums. It truly is drug store quality in my opinion. Unfortunately, it did very little for my lines and wrinkles. Neutrogena Rapid Wrinkle Repair Serum is white to light-yellow in color. It looks more like a lotion when it first pumps out of the tube, but it’s a serum. It’s very lightweight, and not gooey at all! It feels very silky when it hits your skin. I took it one step further and also applied to my neck. It’s interesting because the directions state that you can use it under your makeup during the day as a primer. This is very unusual and uncharacteristic of retinol products, as the potency of retinol is compromised in the sun. Knowing this I didn’t use it during the day but used it every night. As soon as it hits your skin it begins to absorb, and then within 20 seconds it’s dry which I love! I really like the smell of this serum! It’s honestly one of my favorite things about it. They added in fragrance and it smells so refreshing and clean, I wish it was a body lotion. After waking up the next morning after using Neutrogena Rapid Wrinkle Repair Serum, I didn’t really notice much change to my skin. My skin looked smooth and felt hydrated, but that was about it, there was no real WOW factor. Longer term I still didn’t notice anything spectacular about how this made my skin look. My skin didn’t get any worse, and I didn’t experience any side effects but there was really no miraculous transformation either. My skin did feel a little smoother as time went on, and I noticed that my makeup went on well. My face had a very healthy glow about it, but I didn’t see my lines and wrinkles getting any less noticeable. It almost reacted as a good moisturizer rather than a retinol serum. 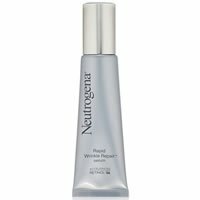 Neutrogena Rapid Repair Wrinkle Serum contains retinol SA. This in theory is supposed to be one of the best forms of retinol because it has the ability to really get into your skin. In addition, it contains Glucose Complex and Hyaluronic Acid. Glucose is intended to hydrate your skin. Hyaluronic acid is supposed to increase the rate at which fine lines and wrinkles disappear. This serum contains a good combination of ingredients on paper and should be very penetrative, but I just didn’t find that to be the case. A one ounce tube Neutrogena Rapid Wrinkle Repair Serum costs $20.99. This is pretty inexpensive as far as retinol treatments go. Neutrogena offers a 30-day 100% satisfaction guarantee when you buy it from their online site, which is great. If you buy this product in a retail store, then it would be subject to that stores return policy! To buy Neutrogena Rapid Wrinkle Repair Serum, click here. Texture/Feel It’s very lightweight, and not gooey at all! Drying Time This serum dries really quickly. Smell They added in fragrance and it smells so refreshing and clean. Short Term Results I didn’t really notice much change to my skin. Long Term Results My skin did feel a little smoother as time went on, and I noticed that my makeup went on well. Guarantee Yes, Neutrogena offers a 30-day 100% satisfaction guarantee when you buy it from their online site. Price It’s $20.99 for 1 oz… pretty inexpensive as far as retinol treatments go.